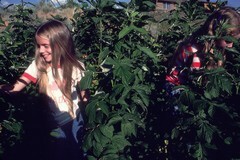 Two young Caucasian females can be seen behind some plant leaves. They seem to be picking some berries on a sunny day. These women are members of a larger Mormon family who are being studied for their low rate of cancer deaths.